Rare 19th Cent Wedding Band Hog Scraper Candlestick. Hog Scrapers were used to remove the bristles from a pig once killed and rolled in hot ashes. These were hand held discs with a tubular handle. Inevitably they doubled up as candle holders thus started the design for the 'Hog Scraper' candlestick. 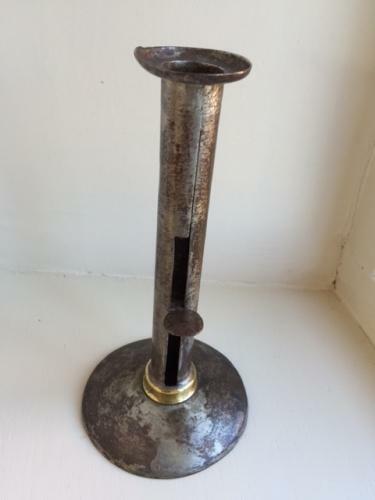 This candlestick is an early example having the typical downturned dish base, evidence of original paint, side ejector but with a brass ring at the base. These are very rare to find and were traditional given as wedding gifts.